Passion is sometimes downplayed as dangerous rather than being adventurous. Mikael Daez begs to differ. He's been traveling to different places, has gone thousand of miles away from home but still stays very basic. What brings him to these other countries is his love for culture, to see what's different out there and perhaps learn a thing or two about their culture, then make it his for a while. I've been really asking about the status of their relationship (his latest post says it all), apparently the current title is "travel buddy" and "friend" but they look like a real couple and I'm not convinced LOL (but personally I think they're a pair - please don't quote me on that cc: Ms. World Megan Young). 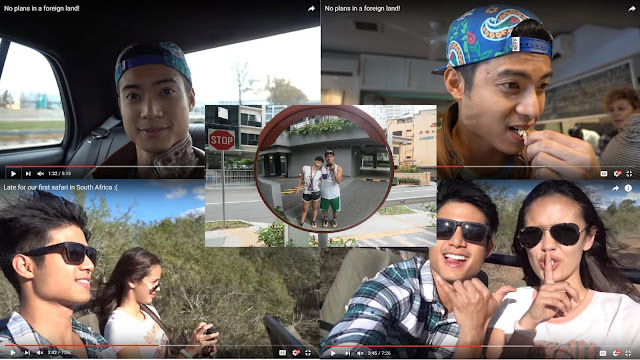 Although adventurous by default, Mikael Daez wants live life to the fullest. He even wants to take as many people with him as possible on these trips (so imagine how expensive that would be LOL). He's now harnessing the power of social media too and he's putting it all in his journal, his own website www.mikaeldaez.com and his Youtube channel Youtube.com/MrMikaelDaez. It's fun to see him outside the studios, raw, just feeling the place's vibe as he gets to eat the food, meet the people and see the places he's been to. You kinda envy him, but somehow make it your goal to someday, some way, you'll find a way to travel there and feel it too. You should check out his notes on the website and read how he runs his life with passion, you kinda also see how he's so engulfed in this flame he calls life. Mikael by the way is still in Poor Senyorita paired with Asia's Songbird Ms. Regine Velasquez - Alcasid so please watch that too!